You will earn 10,019 Reward Points. Earn 1 reward point for every 1 dollar spent. For large parties and other events, it's crucial to have the Geneva 76511 Chalet Portable Bar. This bar is 47.50 inches tall. Our Chalet Collection boasts rustic charm and rugged design. IPE wood is an environmentally responsible choice and is virtually dent resistant. 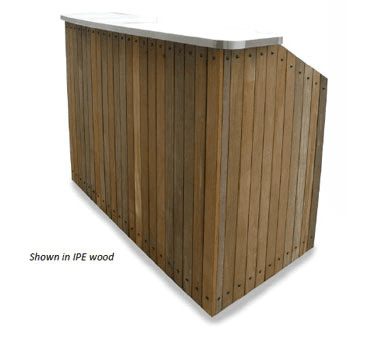 The wood slats over stainless steel interior construction ensures long-lasting durability suited for indoor and outdoor beverage service. Our models are handcrafted in the USA. Geneva’s portable bars offer design flexibility; you can add options for the interior and exterior to tailor your establishment. We offer excellent lead times. We are the only ones that offer the option that converts the bar to furniture with a convertible speed rail. CHANNEL BASE CONSTRUCTION Prevents racking and adds strength, especially when transported over uneven surfaces. ICE BIN WITH DRAIN: Ice bin shall have enclosed foam insulation with drain. Ice bin shall have a 50 lb. ice capacity. 6 circuit sealed-in cold plate shall be compatible for use with Pre-Mix and Post-Mix systems. FULLY STAINLESS STEEL INTERIOR: Work surface shall be constructed of 18- gauge stainless steel. Wall shall be constructed of 20-gauge stainless steel and the base shall be constructed of 18- gauge stainless steel. INTERIOR: Tig and resistance welded. Full length heavy gauge stainless steel angles reinforce from corner of body on inside, with high impact edging on outside corners. Full backsplash sealed to NSF standards. Easy-to-clean stainless steel interior. TOP: There are many surfaces available. Solid surface- material options are Bone, Rocky Road Granite, Lave Granite, and Ebony Granite. Granite material options are Luna Pearl, and Uba Tuba. Also in stainless steel. Additional solid surface options available. CASTERS: Thermal plastic rubber casters. The 5 and 6 foot models come with 5” (4 swivel, 2 lock). The 8ft model comes with 5” (4 swivel, 2 lock, 2 ridged). 1 ½” height from the floor for easy travel over thresholds. Concealed casters for appearance of elegant furniture. There is an available 6” caster upgrade.